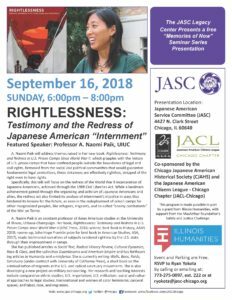 A. Naomi Paik will address themes raised in her new book, Rightlessness: Testimony and Redress in U.S. Prison Camps Since World War II, which grapples with the history of U.S. prison camps that have confined people outside the boundaries of legal and civil rights. Removed from the social and political communities that would guarantee fundamental legal protections, these detainees are effectively rightless, stripped of the right even to have rights. Specifically, this talk will focus on the redress of the World War II incarceration of Japanese Americans, achieved through the 1988 Civil Liberties Act. While a landmark achievement gained through the organizing and activism of Japanese Americans and allies, the redress act also limited its analysis of internment’s injustice in ways that hindered its lessons for the future, as seen in the redeployment of prison camps for other marginalized peoples, like refugees, migrants, and so-called “enemy combatants” of the War on Terror.